YOU COULD BE KILLING OUR TREES! Absolutely NO outside firewood allowed! Let nature embrace you...come stay with us at Evergreen Trails Campground. Located in the heart of Allegany County NY on 211 picturesque acres, Evergreen Trails Campground has been described by one camper as "the Southern Tier�s Hidden Jewel." Whether it be a stay in one of our rustic cabins, a wooded RV site, secluded, creek side tent site or spacious seasonal site, Evergreen Trails Campground has something to accommodate every camper�s need. Evergreen Trails Campground is a perfect vacation or weekend get-a-way. We promise to provide a peaceful and relaxing atmosphere. Enjoy a day at the campground fishing in one of our 2 ponds, take a leisurely stroll or lively hike on one of our hiking trails (where you are likely to see deer and other wildlife) or visit one of the many area attractions such as Letchworth State Park (the Grand Canyon of the East), antique shops in Angelica NY or the Finger Lake Wineries. Come visit the best of Private Campgrounds in New York and experience the beauty of Allegany County NY. 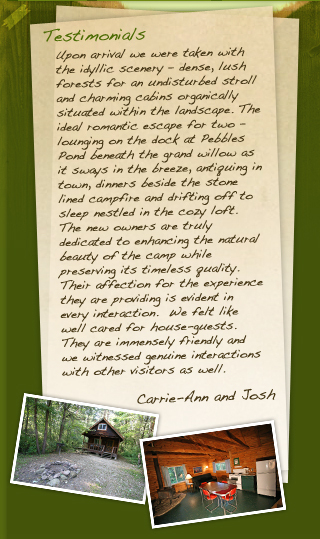 Make your plans early to enjoy our Western New York Camping, NY Log Cabins, or RV/tent sites. Please contact us at 585-466-7993, email us or use our online request form.